Many women put off learning self-defense because they think they are too weak and clueless about how to defend themselves. But prudence dictates that they learn self-defense techniques for their own good. Be aware of your surroundings, many threats on the streets can be avoided. If you see or sense problems on your way, change routes or go to the other side of the road and prepare to run and defend yourself. This is debatable, but many feel that wearing revealing clothes and jewelery when walking in the streets especially at night, is asking for trouble. Never walk alone. Use trains, buses, taxis, especially late in the night. When in taxis, note down its number and if possible inform someone. Never act or look like an easy target. Body language is very important. Look strong and confident. Most fights are won before they start, and aggressors will back down if you maintain eye contact and are intimidated by them. There is only one rule if you are attacked - survive. Scream, scratch, bite, hit, kick or attack with a common object. Do all that is needed to end the threat or have enough time to escape. Everything that surrounds you can be used as weapons. Like ashtrays, chairs, bottles, kitchen utensils etc. while at home or sand, stones, coins, knives, finger rings, pencils, iron sticks, knitting needles, belts or your cellular phone while outside. Any Aerosol cans, hair spray, body spray, spray paint, pepper, tear gas etc. can be used to buy time. At any one time, people unconsciously carry many potential weapons. For example, belts may be used as garrote or a whip with a buckle, coins may be thrown on to the face of an opponent to stun and blind him, clothes may be used to whip, ward off attacks, choke and obscure vision, etc. Handbags can be used to strike or strangle. The purse may contain a lipstick case to poke into the eyes, a hair brush to scratch across the eyes, perfume to sprays into the eyes, etc. GROWING OLDER IS MANDATORY. GROWING UP IS OPTIONAL. The least we can do as individuals is to motivate and inspire another human being! Because a candle loses nothing by lighting another! "Thought you or anyone you know would be interested in http://www.cqdtonline.com/. Its an online self-defense school. convenient way to learn self-defense with any friend or family member you want. When you logon use the coupon code: defense4 for a -10% discount on all tuition following your free first month." CQDTonline is the world’s only self defense school tailored to your needs. Providing a reality based martial art system that is proven to be street dependable and court defendable. You learn self defense anywhere, anytime, with anyone you choose, for minimal cost. You have influence over what you learn. 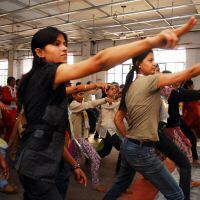 Classes will teach from street scenarios suggested by members to better prepare you to use self defense technique. Interact with your instructor and fellow members via the social network. Utilize groups, forums, and messaging to further your learning. Contact your instructor with questions and receive personal attention anytime via email, video email, and via the social network. You are no longer one in a crowd; utilize the interactivity of CQDTonline to learn at your own pace, at your own schedule, by your terms.